Natalie King, 26, started college at 16 and just received her degree from UIC this week. Her groundbreaking research is discovering helpful therapies for children with autism. Don’t limit yourself to just one dream, Natalie King says. 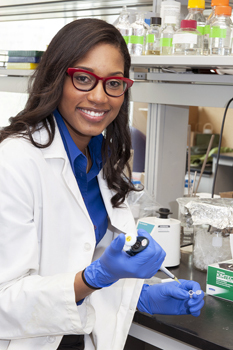 At age 26, King is one of the youngest students to graduate from UIC’s neuroscience doctoral program. She completed her coursework and research, including a complex study on autism, while pursuing a career as an international model. King started college at 16 after combining her junior and senior years in high school. She received a degree in biology from Oakwood University in Alabama, then was recruited to the College of Medicine’s Bridge to the Doctorate Program for underrepresented minorities in neuroscience. King conducted her dissertation research with Mark Rasenick, distinguished university professor of physiology and biophysics. The researchers examined blood cells to determine the importance of serotonin and its receptors in children who have autism, King said. “We’re trying to come up with a very simple screening to use patients’ blood cells to predict what therapies will be useful for kids with autism,” Rasenick explained. Her Ph.D. completed, King is now working with the Liautaud Institute as its senior research specialist. She develops leadership development programs that center on emotional and social competency. She’s continuing to work as a model, a career that took off while she was in graduate school. She’s modeled for the globally distributed Johnson’s “Gentle Treatment” hair care products and Black Opal cosmetics, as well as at local events such as Chicago Fashion Week. Read more at UIC News.